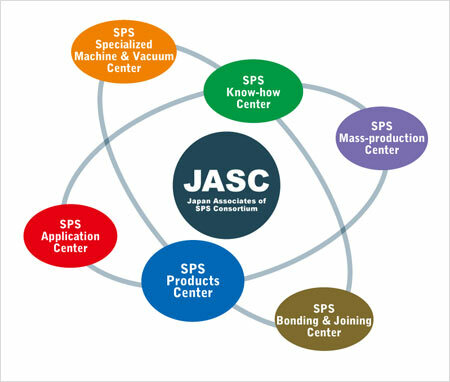 JASC is the world’s largest SPS contract R&D Center. JASC is experienced in helping academia researchers, business managers in industries meet with above mentioned these needs and objectives. JASC is a contract research, development, SPS proto-products & parts manufacturing and SINTER LAND/SUWA-NETSU brand SPS system machines manufacturer and SPS related technologies consulting & servicing consortium offering to industries, universities and governmental institutes a unique fusion of scientific, technological marketing and production system supply capabilities. We at JASC provide more than 10 units of variety of SPS apparatuses from a desk-top type small SPS to a large sized SPS employing 300 tonf/30,000A DC pulse generator and a tunnel-type continuous SPS system for production purpose at any time. SINTER LAND supplies the LABOX/JPX series of SPS machines and SUWA-NETSU supplies the DR.BONDER of Bonding & Joining equipment. JASC offers SPS know-how, versatile processes and emerging beneficial applications using SPS technologies. •Designing and manufacturing of Specialized SPS machines, Sputtering equipment, nano-powder preparation equipment using micro-wave plasma and PEEM(Photo Emission Electron Microscope). •Contract Job-shop for R&D of new materials, products and components by SPS with Ultra-high precision mechanical machining techniques. •Contract Job-shop for R&D of new materials, products and components by SPS & high precision grinding and mirror-polishing techniques. •Designing and manufacturing of SPS bonding & joining equipments.